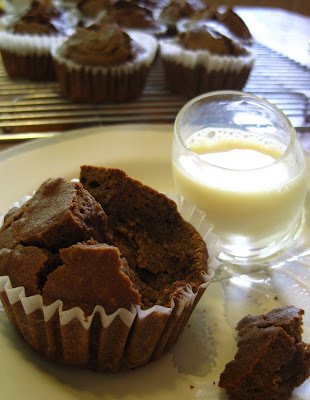 I'm continuing down my gingerbread-lined path with ontbijtkoek (Dutch spice bread) muffins. While the Danish honningkagehjerter dough ages in the refrigerator for two days before it's baked, the Dutch ontbijtkoek age for one day after it's baked. 1 Preheat the oven to 300 degrees Fahrenheit. 2 Combine all ingredients into a smooth paste. 3 Lightly coat a cake tin or individual muffin wells with butter and fill with the dough. 4 Bake for about 1 hour. 5 When cooled, cover in tin foil for 24 hours before serving. Keep covered or bread will dry out. For Honningkagehjerter, Part I, click here. So after the dough has been in the fridge for two days, pull the dough out and let it come to room temperature to make it easier to roll. "Flour" your surface with unsweetened cocoa and roll out the dough. Use a heart-shaped cookie cutter. Bake at 370 degrees for 15 minutes. Let cool completely then melt semisweet chocolate in a double-boiler. Paint the tops of the cookies with a layer of chocolate. For a more traditional look, press decorative bits of paper into the chocolate before it cools completely. Steel yourselves. Just as October spawned a glut of pumpkin recipes, I am entering December on a similar gingerbread kick! I love the kick of ginger and the richness of molasses. To stave off the morning chill, I whipped up a batch of gingerbread muffins and served them with chilled eggnog. Yum! Cream sugar and butter, add dry ingredients, add egg, molasses and water, stir until completely moistened. Bake at 375 degrees for 30 minutes. I like my gingerbread dense and almost pudding-like. If you like a lighter, more cake-like, gingerbread. Add 1-1/2 t of baking powder to this recipe. 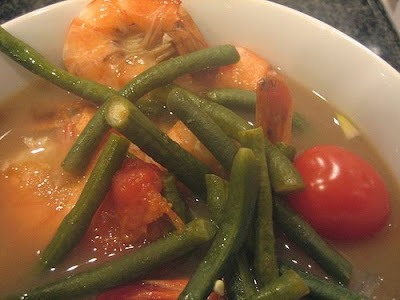 From the piquant tamarind to the bitter mustard greens, Grandma's sinigang was always my favorite. Over the years, I would ask her for the recipe or, at the very least, to let me watch her cook it so I could learn. She would always decline, saying, "No, Cami, whenever you want sinigang, you just come visit." So, I did. At the end of the afternoon, Grandma walked us to the front door to say goodbye. As she hugged me, she said, "Now, I will show you how to make sinigang. Come back next week." "Why now?" I asked, equally excited and flabbergasted. She just smiled and patted Jacob's shoulder. "Don't worry. I will teach her how to make sinigang for you, Jacob." I should apologize, in advance, to my two favorite Danes because I have taken my usual culinary liberties with this traditional Danish Christmas cookie. Undskyld på forhånd! And the reason this is "Part I": the dough must sit, refrigerated, for two days before it can be rolled and baked. One thing that posed challenging - the original recipe calls for hjorthornssalt which is baker's ammonia; hjorthornssalt was originally made from the ground antlers of reindeer. I substituted baking powder and am hoping for the best. Place sugar, honey, molasses, and butter in a saucepan and cook until the butter is melted. Whisk the eggs and spices into the mix. Sift flour with baking powder and knead the dough thoroughly. Wrap and place in the refrigerator for two days. Look for "Part II" in two days. 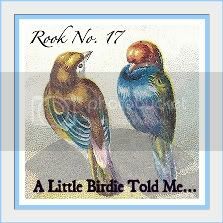 Intrigued and inspired by Rook No. 17's Salted and Chocolate Covered Tamarind Caramels, but still without a candy thermometer, I decided to try a tamarind truffle instead. They were a sweet hit at the end of our Thanksgiving feast. In a small, heavy saucepan bring the whipping cream to a simmer. Place the chocolate in a separate bowl with tamarind paste and 1/4 t ground ginger. Pour the cream over the chococlate. Let stand for 3 minutes. Whisk till smooth. Allow to cool, then place in the refrigerator for at least two hours. 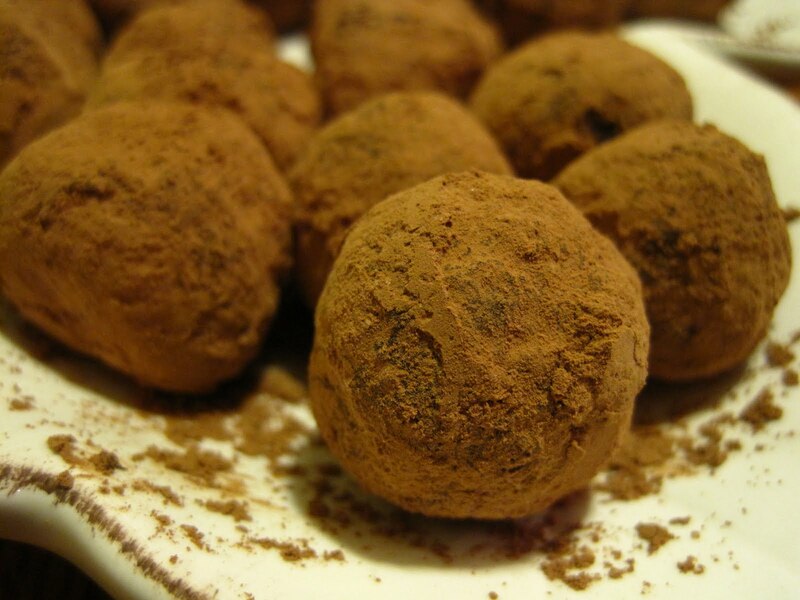 Roll half-teaspoon sized balls in your hands as quickly as you can. Roll in unsweetened cocoa and the remaining spices. Place on a baking sheet lined with parchment paper and refrigerate overnight before serving. *I'm pretty sure that Jenn Erickson (Rook No. 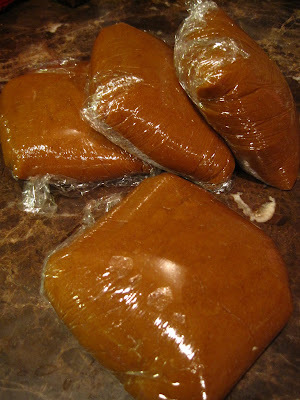 17) purchased her tamarind paste at Whole Foods; I bought a wet tamarind paste from an Asian market. This recipe called for gooseberries that were completely impossible to find here in Monterey. I tried for huckleberries but was equally unsuccessful. So I settled on a blueberry-cranberry mixture. Mix all the dry ingredients together and, using a pastry blender, cut the butter into the flour mixture. Pat half the dough into a buttered baking dish and sprinkle with 1 T of cornmeal. Bake in a 350 degree oven for 15 minutes. In the meantime, mix the berries together and stir in honey, lemon juice, and fresh, rough-chopped mint. Pour into pre-baked crust. 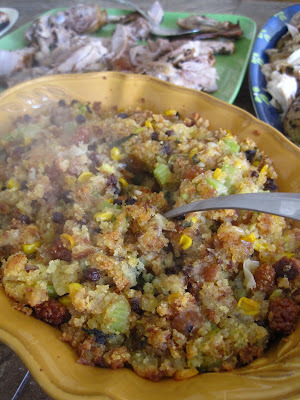 Top with remaining dough, sprinkle with the last T of cornmeal. Return to oven and bake till the topping is browned and the berries are bubbling. Not being a big fan of turkey meat, and bolstered by Krulwich Wonders blog on npr.org, I decided not to serve turkey on Thanksgiving. Instead, I opted to serve quail, duck, pheasant, and chicken. I stuffed the duck and chicken with navel oranges and lemons, rubbed them with a dry mixture (ground ancho chilis, ground sumac, ground cumin, oregano, and sea salt), then roasted them in a 350 degree oven. Both birds were around 6 pounds and took about 2-1/2 hours to cook completely. The pheasant, pictured, weighed a little less than 3 pounds and cooked in about an hour. My Thanksgiving meal involved some bartering. I had offered to trade some freshwater pearls for some fennel pollen, but when Jenn Erickson - of Rook No. 17 - met me to trade pearls for pollen, I was delighted to find some bonuses: wild dried tepin chilis and a Madagascar vanilla bean. 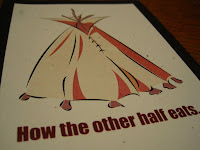 I had to do some reading about the tepins, but realized they would add some spectacular flavor to my Comanche marinade. I was right! Wow. Now I just need to think of something to do with my fragrant vanilla bean. Whisk all marinade ingredients together and marinate quails for at least 6 hours. Grill over hot coals. 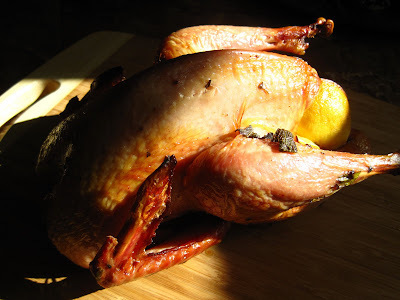 I've never liked stuffing that was actually cooked inside of a bird. Just a quirk...so I make the stuffing separately. Start with your favorite cornbread recipe. Sauté chopped celery, onions, leeks, and fennel bulb in butter till softened. Add fresh, rough chopped sage leaves. Cube the cornbread and stir in the butter mixture. Blend till the cornbread is completely moistened and begins to come together. 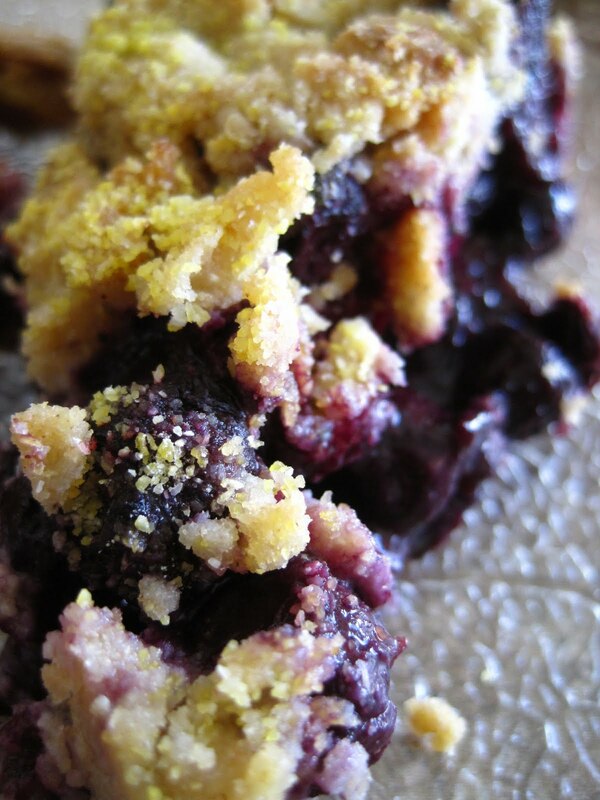 Mix in dried currants, dried mulberries, chopped roasted chestnuts, and yellow corn kernels. Season to taste with sea salt and black pepper. This was - by far - one of favorites for the day! The original recipe calls for cattails, but offered a substitution suggestion of water chestnuts. Worked perfectly. Cook the wild rice in broth till the grains begin to split. Sauté onions and red peppers until softened. 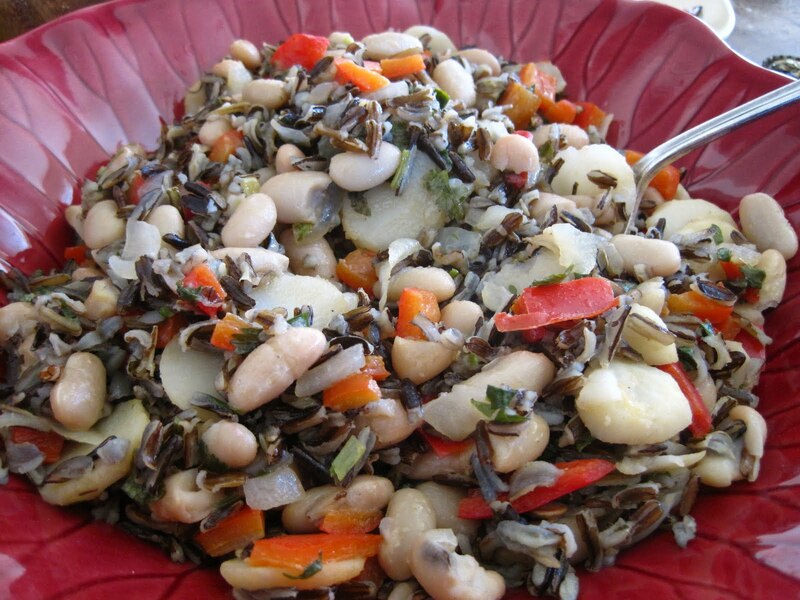 Stir in the cooked wild rice, cooked white beans, and sliced water chestnuts. Season with sea salt, a splash of lemon, and whatever fresh herbs you have on hand. I used parsley. 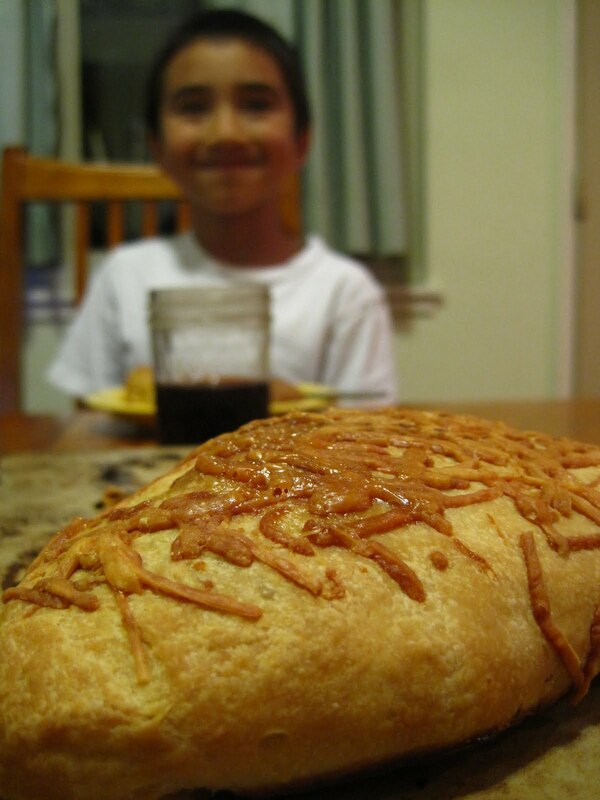 I know, I know...I spent about six weeks baking nothing but pumpkin, but this Native American variation was superb. It's an Ojibwa recipe from Ottawa, Canada. Cut a hole in the top of the pumpkin and scoop out the seeds. Place two orange halves in the cavity and fill the pumpkin half-way with water. Bake in a 350 degree oven for 1-1/2 to 2 hours. Let cool then slice into wedges. Brush with melted butter, drizzle with maple syrup. Bake again till the tops begin to brown. What a nice, sweet flavor foil to salty roasted meats! Since Uncle Brian - "the best killer in the family" as Dylan calls him - had killed a deer earlier and offered me some ground venison, I dug up a recipe for a corn soup with venison from the Oneida tribe in New York. The recipe I found simply read: "Corn, wild rice, venison, water, wild greens. 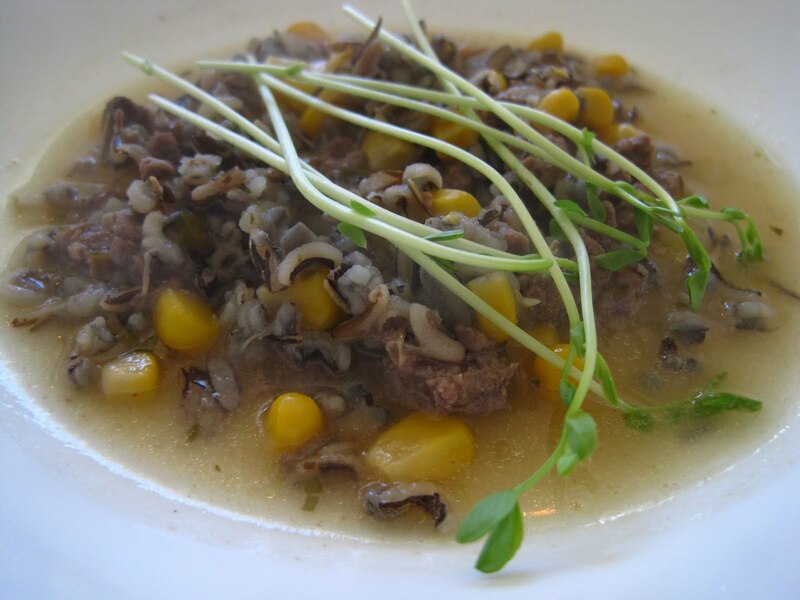 Cook corn in water with bits of venison, wild edible greens and a handful of wild rice." Cook wild rice. In a large soup pot, sauté the fennel and onion till they begin to soften. Add the venison and brown meat until completely cooked. Add yellow corn, wild rice, and chicken broth. Simmer for an hour. Serve with fresh, organic pea sprouts. Dissolve yeast in warm water. In a large mixing bowl, beat together the egg and cheese until smooth. Add melted butter and yeast mixture. 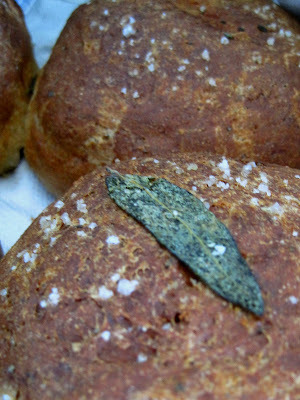 Add flour mixture slowly, beating vigorously after each additiontill a stiff dough is formed. Cover dough with a cloth and let rise in a warm place for an hour or until dough is almost doubled in size. Punch down, knead for a minute, and roll into rounds. Place on a buttered baking dish. Sprinkle coarse sea salt over the top and press a fresh sage leaf into the top. Cover and let rise for another 45 minutes. Bake at 350 degrees for one hour. 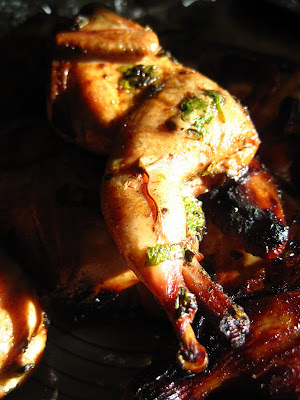 I served this with a dipping sauce of pumpkin seed oil and pomegranate balsamic vinegar. Wow! I'm happy to report that the Native American feast was outrageously well-received with smiles of appreciation and groans of gluttony. Photos and recipes to follow. But first I need to set a few carcasses to simmer for a pheasant-duck stock. 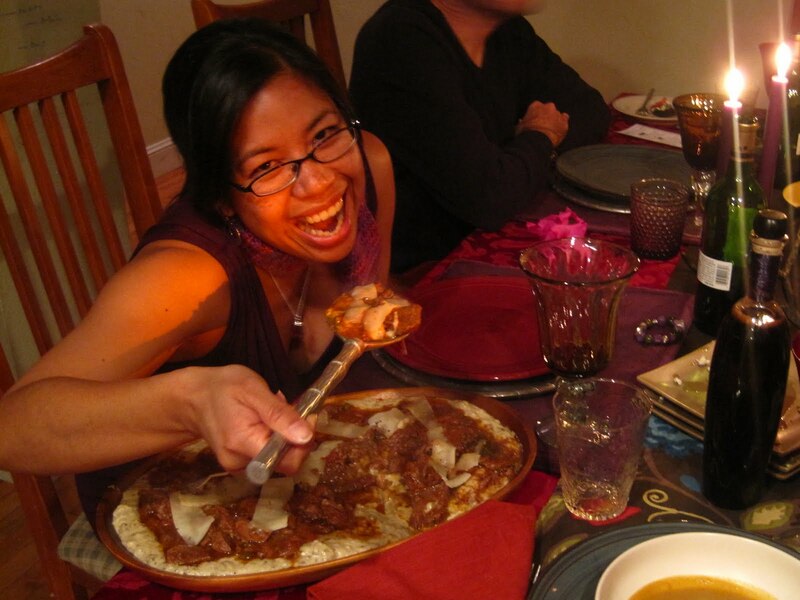 My friend, culinary comrade and fellow Cal-gal, Jenn Erickson invited me to link up some recipes for "last minute entertaining" or "quick appetizers" at her blog: Rook No. 17. Take a look at her recipes and crafts. The only danger - you'll be captivated and spend more time there than you probably have. That's what always happens to me! Yes, that does mean eggplants and chocolate. 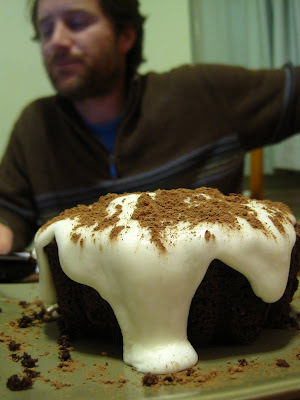 When I mentioned this dessert to friends, reactions ran the gamut. My favorite response: "You have successfully made me gag, but if anyone could make chocolate and eggplant taste good, it would be you." Aw, thanks, Cathy. Step one: peel and thinly slice your eggplants. Step two: coat your slices with a thin layer of flour (I used 100% organic white whole wheat flour). Cook the eggplant in melted butter till they begin to soften and brown. 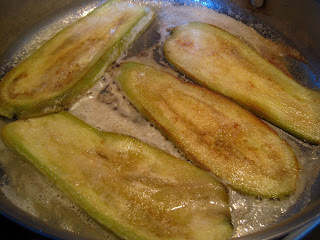 Step three: While still warm, dip each slice of eggplant in a mixture of sugar and ground cinnamon. Press gently to coat both sides. Set aside until ready to assemble. 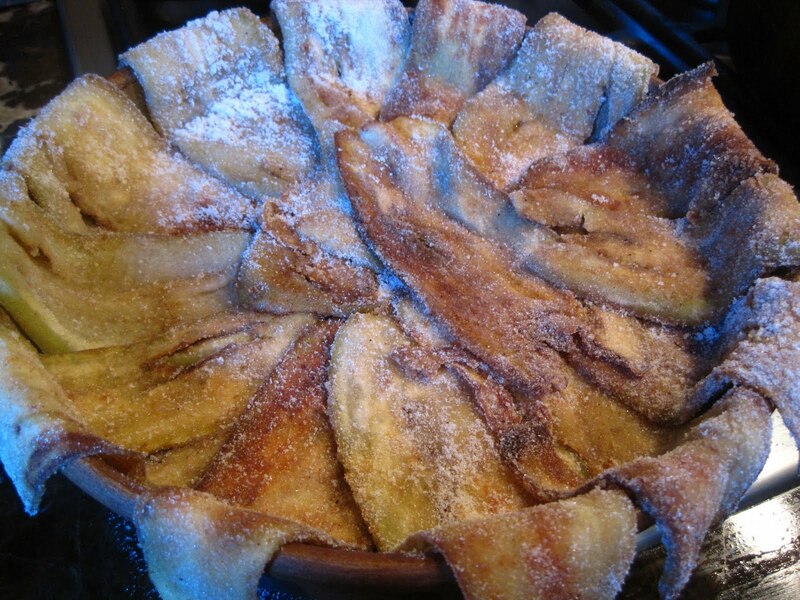 Step four: Line the bottom and sides of the baking dish with slices of eggplant, arranging them so there are eggplant slices draping over the sides of the dish. In the meantime, create the filling: ricotta cheese, ground cinnamon, 2 eggs, and crushed amaretti cookies. 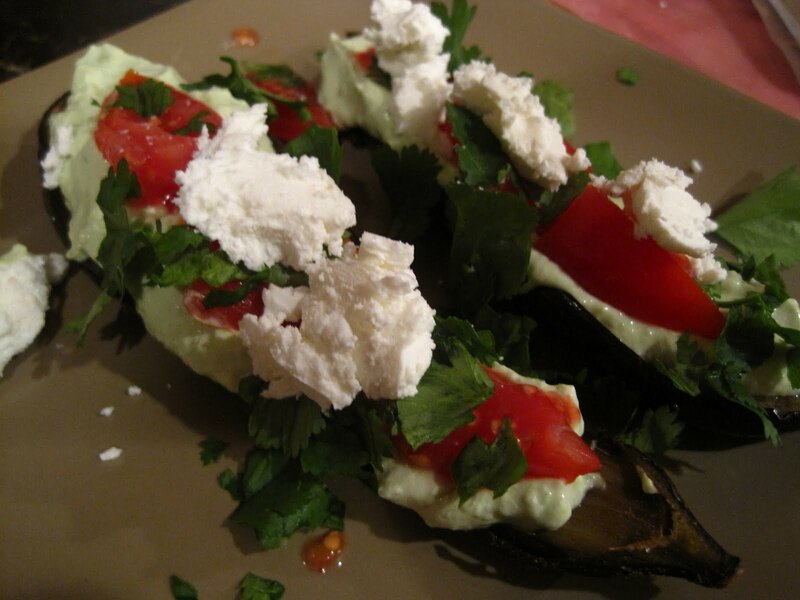 Step five: Gently spread a layer of ricotta filling over the eggplant. 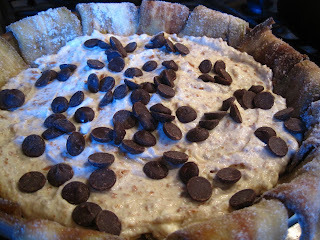 Then sprinkle semi-sweet chocolate chips over the ricotta. Repeat the layering of eggplant, ricotta, and chocolate until your baking dish is full. Step six: Fold the eggplant draped over the side of the dish inwards, like a package, to close the dessert. Bake in a 375 degree oven for 20 minutes. Step seven: Let cool completely. Then unmold onto your serving platter. Sprinkle with powdered sugar to serve. This recipe starts with roasted eggplant puree. Click here to see how I make it. Cube lamb and brown in a pan with some butter, a splash of olive oil, and minced garlic. Once all the sides of the meat have been seared, add tomato puree, a splash of red wine, capers, and some bay leaves. Simmer for three hours. Make a basic cream sauce. Stir in the eggplant puree. Slice in some sheep's milk cheese. Season with pink Himalaya salt and freshly squeezed lemon juice. Serve the lamb on a bed of the eggplant puree. Top with thinly sliced sheep's milk cheese. Inspired by the fragrant eggplant curries I've had, I decided to turn those flavors into a soup for one of the courses of my 'Ode to an Aubergine' dinner. I roasted eggplants, onion, carrots, tomatoes, and butternut squash. Once they were all cooked, I put them all into a large soup pot with beef boullion. Season with curry powder, cinnamon, ground ginger, ground cardamom, and pink Himalayan salt. Add a splash of red wine and simmer for an hour. Puree in a blender till smooth. Stir in coconut milk and cool completely. Make this soup the night before you serve it so the flavors have a chance to develop. 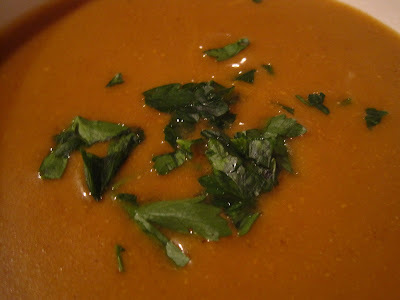 Serve hot with a sprinkling of fresh, rough-chopped parsley. Halve and roast eggplants till softened in a 400 degree oven. 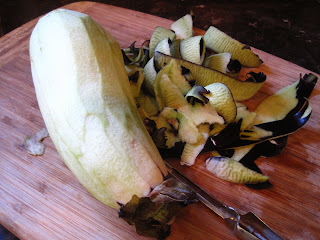 Click to read how I roast eggplants. For this recipe, don't scrape out the meat for eggplant puree; use the roasted eggplant half as is. Top with an avocado cream, fresh tomatoes, fresh cilantro, and chevre (goat's cheese). Avocado cream is 1 C of sour cream and 1 ripe avocado mashed together. Torretta di Melanzane e Mozzarella means "little tower of eggplant and mozzarella." Slice eggplants about 1/4" thick and sauté in olive oil till they are softened and beginning to brown. 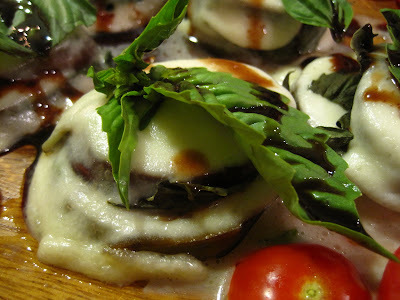 Layer eggplant, fresh mozzarella, fresh basil. Repeat. Place in a hot oven to melt the cheese. Garnish with fresh mozzarella and a drizzling of pomegranate balsamic vinegar. Serve with fresh tomato slices. These are very similar to my Irish Car Bomb cupcakes except that I use Frangelico (hazelnut liqueur) in the filling and glaze instead of Bailey's and Jameson's. 1 cup stout (Guinness), 2 sticks butter, ¾ cup unsweetened cocoa powder, 2 cups all-purpose white whole wheat flour, 2 cups organic cane sugar, 1½ tsp. baking soda, ¾ tsp. sea salt, 2 large eggs, 2/3 cup sour cream. Preheat the oven to 350° F. Butter the mini bundt pans. Combine the Guinness and butter in a medium saucepan over medium heat. Add the cocoa powder and whisk till smooth. Remove from the heat and allow to cool slightly. In a large mixing bowl, combine the flour, sugar, baking soda and salt. In the bowl of an electric mixer fitted with the paddle attachment, beat together the eggs and sour cream to blend. Add the stout-butter mixture and beat just to combine. Mix in the dry ingredients on low speed just until incorporated. Divide the batter evenly between the mini bundts, filling them about 2/3 to ¾ full. Bake until a toothpick inserted in the center comes out clean, about 25 minutes. Allow to cool in the pan for 5-10 minutes, then transfer to a wire rack to cool completely. 8 oz bittersweet chocolate, 2/3 C heavy cream, 2 T butter, 2 t Frangelico, 4 oz marscarpone cream. Bring the cream to a simmer, remove from heat, add the chocolate, butter, and Frangelico. Let sit for 3 minutes. Whisk till the chocolate is completely melted. Then whisk in the marscarpone. Cool. Once the cakes are cooled, cut a cone shape piece from the center, fill with ganache, and replace cake plug. 8 T butter, 4 C confectioners' sugar, 8 T Frangelico. Blend these ingredients together over a water bath till glaze is smooth. It will thicken as it cools. Pour over filled cake and dust with unsweetened cocoa powder. I'm not sure why so many eggplant recipes begin with roasting the eggplant, but I'm certainly not going to argue with the resulting silky perfection! Depending on the size of the eggplant, slice them lengthwise in halves or in quarters. Roll the eggplant in olive oil and sprinkle with sea salt. Cover your pan with aluminum foil and roast in the oven until the eggplant is completely soft - usually between 1-1/2 hours and 2 hours. Undercooked eggplant, to me, tastes like chalk. Yuck! 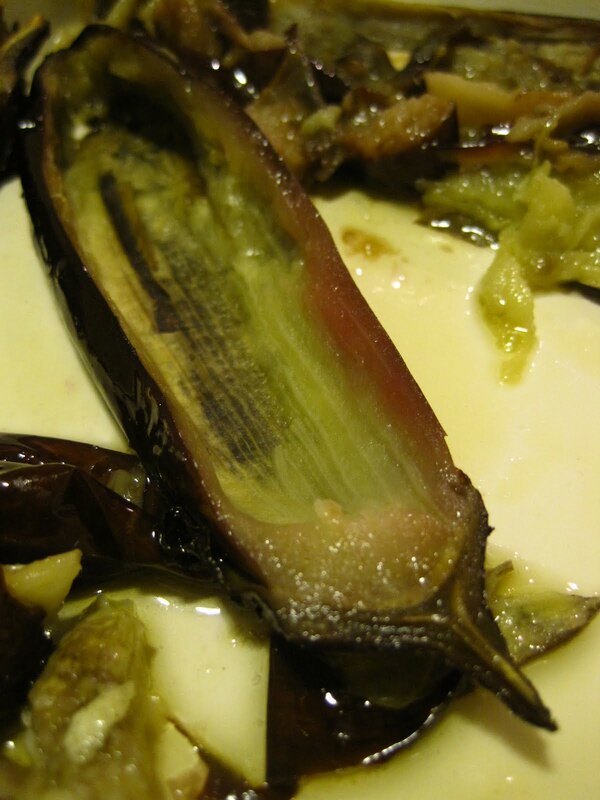 Once your eggplant is cooked, squeeze lemon over it, then scrape the meat from the skin. This silky eggplant puree is the basis for so many Mediterranean recipes. 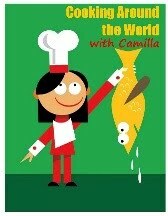 I'll post some of my favorite recipes shortly. Never before did I realize how many of my friends revile the eggplant. And I am not talking about people with parochial palates; I am referring to good friends with whom I share meals on a regular basis. Fellow foodies. But they "don't eat eggplant." That is simply unacceptable. My view: if you don't eat something, you just haven't had it properly prepared. So, for two friends' birthday dinner celebration, I decided on a theme and menu to bring the enigmatic eggplant front and center - Ode to the Aubergine. 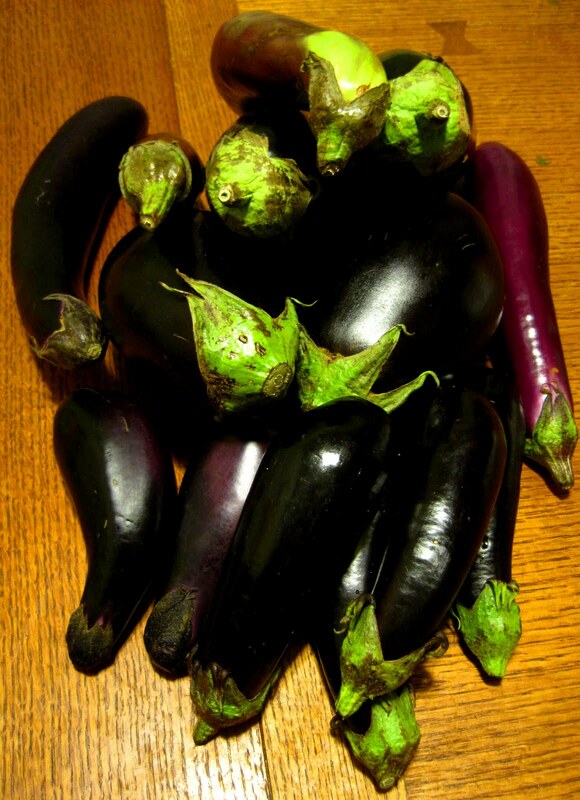 Each dish in every course contains eggplant. The dinner is tomorrow night, so I will report later whether or not I have culinary converts at my table or not. If not, I'm still going to have fun trying. I have fourteen eggplants washed and ready to go. Let's get roasting! Despite having sworn off pumpkins for awhile, when Belle gave me four more pumpkins last week, my resolve evaporated. Tonight I cooked up a batch of pumpkin fudge. 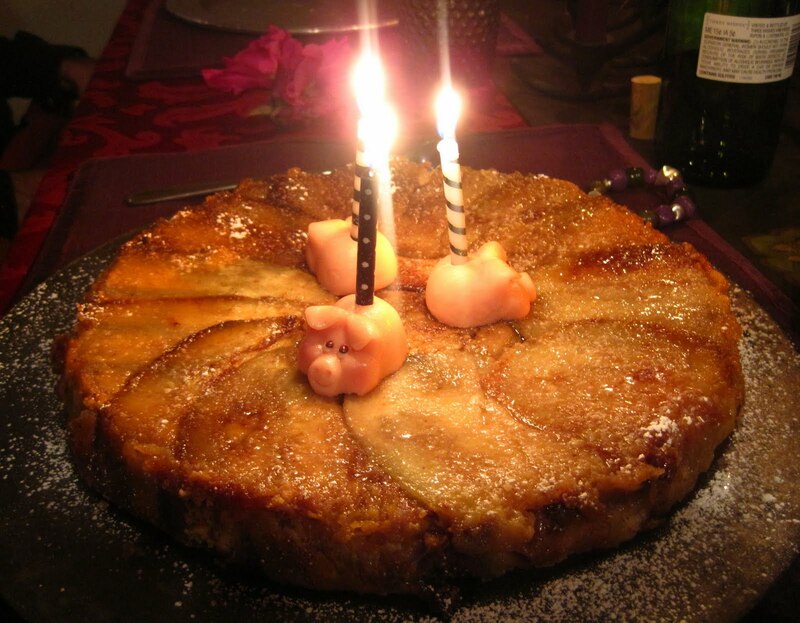 It's too sweet for my tastes, but the sugar pig to whom I'm married thought it was delicious. Cook the above ingredients over a medium flame till smooth. Remove from heat. Stir in 1 c of nuts (I used sliced almonds) and a splash of lemon juice. Pour mixture into a foil-lined baking dish. 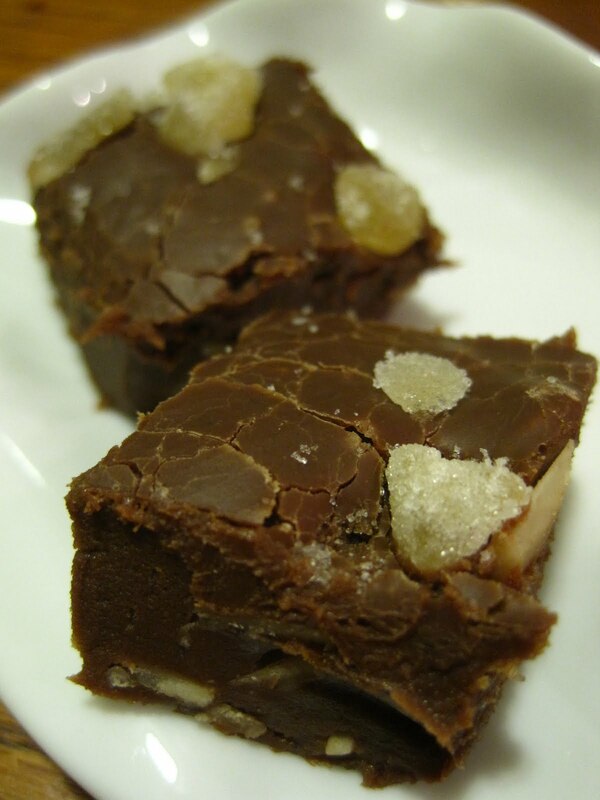 Press crystallized ginger pieces into the top. Let cool completely. Cut into small cubes. I decided to try my hand at a Hot Pocket for dinner tonight. There is a funny back story that leads up to this culinary experiment. Let's suffice it to say that my husband ate a Hot Pocket at a friend's house and showed me the Jim Gaffigan clip about that dreaded food item. And as I usually do, I declared: I can make a healthy version of that. So I whipped up a homemade version that doesn't have 350 calories, 19g of fat, and 850mg of sodium! Mine may be called, not surprisingly, Pumpkin Pockets. The boys - well-trained culinary snobs that they are - turned their noses up as soon as they heard what I was serving for dinner; however, once they realized that I had made them myself, they warmed to the idea. Preheat oven to 400 degrees. Use whatever your favorite recipe is for pizza dough. Roll out a large circle. Place filling on one side. Fold over to form a crescent. Pinch edges to seal. Brush with olive oil and sprinkle with shredded parmesan. Bake for 35 minutes. Serve hot. Whenever I find seckel pears - miniature, gem-colored fruits with a scent that reminds me of a summer's garden - I make this cake. It's simple, but looks elegant enough for a formal dinner. 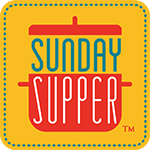 Butter your baking dish and spread a thin layer of brown sugar into the dish. In the meantime, melt some butter in a large sauce pan and place pears - cored, halved, and destemmed - cut-side down in the pan. 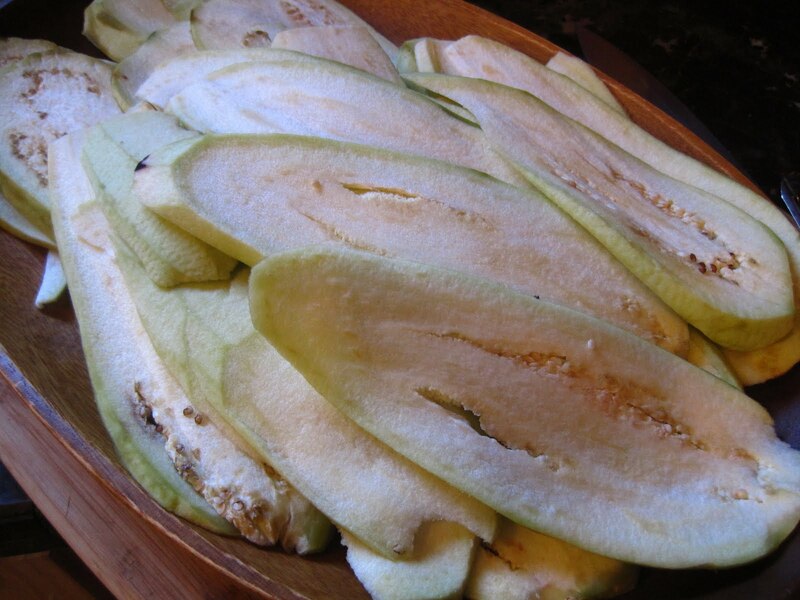 Let pears cook till the cut surface begins to brown slightly. Arrange pears, cut side down. Blend all other ingredients to form a batter. Pour over pears. Bake until cake is a deep brown and a toothpick inserted in the middle comes out clean. Allow to cool in pan for 10 minutes before turning onto a serving plate. Serve warm or cold.